In the small community of Queen, deep in the Guadalupe Mountains of southeastern New Mexico, morning begins with humility. It asks for little at first: a dash of pink in the trees, a ray of sun on the ground. But once those concessions are made, morning here becomes more purposeful, reaching through the forest and over the mountains, across N.M. 137, past the RV park, the store, the fire station, the church camp, the ranches, the cemetery. Dark gives way to light gives way to piñon and juniper green all around and azure blue overhead. Birds chirp and flirt in the trees; a solitary crow wakes up in a bad mood and rants about it, strenuously. If a pickup truck drives past, which is unlikely, but let’s just suppose, you can hear it long before it arrives and long after it passes. The two thermometers on the porch of the Queen Store reach 68 degrees simultaneously and decide to remain there indefinitely. For all its beauty, the whole affair—morning in Queen, that is—seems fragile, like you could blow it all away with a strong puff, as you would the seeds of a dandelion. There is also a chimney. It sits along N.M. 137 west of the store. A building sheltered the chimney once, a wooden structure with a pitched roof and a false front. It was the original Queen store and post office, and inside, that chimney provided warmth during the frigid mountain winters. The store stocked the kinds of things pioneers couldn’t make or grow themselves, like canned tomatoes, flour, sugar, coffee, salt pork. The store closed back in 1920, the timbers put to use in other structures long ago, but the chimney remains. That chimney has a story to tell. An origin story, about the time back in 1891 when Mr. J. W. Tulk opened the store and post office to serve area ranchers and called the place Queen, the surname of a local homesteading family. Queen has been here in various forms ever since. Yet even some people an hour down the mountain in the closest community, Carlsbad—or “town,” as Queen residents call it—haven’t heard of it. The chimney, and indeed most of the land south of the highway to the boundary of the Lincoln National Forest, is part of the Cox Land and Cattle Company, a sprawling ranch comprising several older homesteads. It’s owned today by Janet and Joe Cox. Janet balances five sets of books while Joe balances the demands of this 1,000-head ranching operation. The Coxes, like so many other families here, have deep roots in the Guadalupes—“these old rough mountains,” as Joe calls them. Joe’s family originally homesteaded a place in nearby Dog Canyon. The Coxes bought this ranch and raised their family in Queen with other families like the McCollaums and the Hugheses, forging relationships that persist today. Queen is a small community, about 30 people. For the Coxes, that’s the appeal. “The people care about one another,” Janet says. Every day on the ranch brings a new challenge. Today’s arrives early, in the form of a scheduling conflict. No sooner have Janet and Joe sat down to eat than a work crew arrives to install their new solar-powered well. Joe and their ranch hand, Wayne Kenagy, meet the crew and offer assistance—but the Coxes can’t stay to supervise the job. They’re due at the apple orchard on the X Bar Ranch by 9 a.m. Rusty Smith, the minister at the Guadalupe Christian Camp, in Queen, has organized an apple-picking flash mob to gather fruit for a children’s home in Portales. 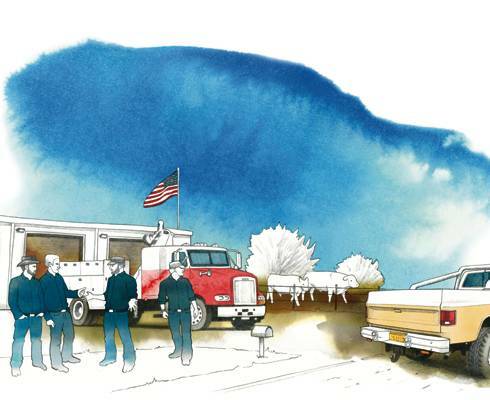 Leaving the crew to their duties, Joe, Janet, and Wayne climb into a pickup and head east along the highway past the chimney and RV park and fire department toward the orchard. They also pass the most poignant structure in Queen: a thin rectangle of cement atop a large stone base, the whole tilted upward toward the southern sky. The monument is purposely reminiscent in both size and form of a small aircraft taking flight, complete with an actual propeller mounted to the front. Sadly, one end of that propeller is bent. The roadside memorial honors Frank Kindel. He lived in Carlsbad, not Queen, but his story belongs here, too. Never mind his extensive business or civic credentials, or even the delight he created riding his old-fashioned high-wheeled bicycle in holiday parades. Frank Kindel was best known for something else entirely. Come Sunday morning, Kindel, who had served as a sergeant in the 607th Aero Squadron during World War I, boarded his two-seater Piper Cub and buzzed over the Guadalupes searching for targets. When he found one—a ranch house, a hunter’s campsite—he’d grab a rolled-up copy of that morning’s Carlsbad Current-Argus newspaper and launch it through a chute to the people down below. After all, what’s Sunday without the paper to read? For this act of aerial altruism, Kindel became known as the Flying Paperboy of the Guadalupes. The day of the accident—May 31, 1964—was the Sunday of Memorial Day weekend. Kindel had a guest on his paper route that morning, the Reverend Willis E. Plapp of the First Presbyterian Church in Carlsbad. Riders in the annual Pecos Valley Trail Ride, who had spent the night in Queen, gathered on blankets in the grass to hear Reverend Plapp, in his jeans and cowboy boots, conduct Sunday service. As Kindel and Plapp took off afterwards and the plane circled the landing strip, inside the cockpit Kindel suddenly cried, “Oh, my Lord!” and the little plane crashed to the ground. Kindel was so beloved that his funeral service in Carlsbad was broadcast over the radio because the church was too small to hold everyone who wanted to attend. The apple picking is already under way by the time the Coxes reach the orchard. Rusty Smith is here, with his wife, Bev. Marion Hughes—whose family homestead over in Dog Canyon a hundred years ago—came, with his grandson Trent and Trent’s wife, Gentry. Albert Hobbs is here too, the fire chief. Armed with ladders and buckets, the workers move determinedly through the trees, gathering the fragrant bounty. There’s teasing all around, glances into a companion’s bucket and playful comments about the low volume of apples inside, then spirited laughter at the joy of being with friends on a beautiful sunny day on top of a mountain. Rusty Smith wisely finds a tree with much of the yield on the lower branches, so the exertion-to-effect ratio is in his favor. There’s only one church in Queen, on the grounds of the Guadalupe Christian Camp, but it serves every denomination. On Sunday, the Catholics, Methodists, Presbyterians, Lutherans, Baptists, you name it, all come together to hear Rusty’s sermon. Rusty prefers an interactive service. If someone in the congregation has a question during his sermon, they raise their hand and ask it. Rusty and Bev Smith came here in 1977 and have run the camp ever since—the scheduling, the cooking, the maintenance, everything. The 150-acre property, originally a horse ranch, became a church camp back in 1956. Today, various camps run throughout the year, like couples retreats, Boy Scouts and Girl Scouts camps, football camps, band camps—even math camps. Bev Smith might cook for thousands of people a year. Part of the old ranch house itself is today the church. If you visit, Rusty will point out the timbers holding up the roof, planed on a local sawmill a hundred years ago. Apples picked and buckets loaded into their pickup, Rusty and Bev wave goodbye, off to Portales. They have enough apples, they think, to give the kids a good bellyache. As the pickers depart the orchard, Albert Hobbs, the fire chief, returns to the Queen Volunteer Fire Department building. It’s just down the highway from the Forest Service sign featuring Smokey Bear reporting the current fire danger. The danger isn’t really EXTREME like the sign says—Albert thinks kids have been playing around with the pointer. He thumbs through a copy of Firehouse magazine at his desk, listening on his radio for a “tone out” that would require him to respond to an incident, like smoke spotted or someone lost in the mountains. Albert is 70 but looks 45, maybe even 35, with shoulder-length gray hair that he’ll trim in a year and donate to Locks of Love, as he’s done twice before. “I’m probably the only hippie fire chief in the county,” he jokes. Outside the fire station, the sun reaches its noon peak, but since the Queen store and café next door closed two years ago, you’re out of luck if you’re hungry. The Coxes built this store before they bought their ranch, opening it the first day of deer season back in 1985, using tables and chairs from an old Dairy Queen in Carlsbad. The featured menu item was the Mountain Man Burger, a colossus revered even in memory. People drove up from town just to have one. For $10.45, they got two half-pound hamburger patties topped with bacon, green chile, cheese, lettuce, tomato, onion, pickles, mayonnaise, and mustard. Wayne Kenagy, son of the current owner of the store and RV park and ranch hand for the Coxes, is known to have made it through one. Albert Hobbs has too. The 20-lot RV park beside the store will fill again in the evening as hunters return from the mountains. Hunters swell the population of Queen throughout the year. At any given time, there could be hundreds of people in the mountains, hunting the game in season or hiking or camping. You might never see them, but you can sense their presence. They are unseen extras in the daily stories that play out here. About ten miles south in Dark Canyon, Kenneth and Pat McCollaum sit down to lunch. Few people know these mountains as well as Kenneth McCol- laum. Fewer people still know the history. Born in 1937 and living and working in and around Queen most all his life, Kenneth carries the memory of the mountains with him like a precious pocket watch, to be taken out on occa- sion and polished so that it remains in working order. Kenneth’s position as fire management officer with the Guadalupe District was one he seemed destined for. On the day he graduated from eighth grade, he was called to help fight a fire, his first, for which he earned ten dollars, enough for a new pair of boots. At age 18, he joined the Forest Service, as his father had before him, and stayed with them until his retirement 32 years later. This is the very homestead where Kenneth himself grew up, the one his family settled back in 1903. His father told him stories of these mountains over the years, of the Indians who lived here long before, of the old foundations up in the canyon, which might have been left by a religious group who tried their hand here until the mountains decided they couldn’t stay. His father also served as the foreman of the CCC camp established here during the Depression, overseeing young men as they built fences and roads through the mountains. His mother taught in area schools, including Queen. The canyon walls yielded slate, which Kenneth’s older brothers used to write on in class because paper was too expensive. Kenneth remembers Frank Kindel fondly. In clear weather, the Flying Paperboy would brave the bluffs of Dark Canyon and deliver a paper to the McCollaum ranch. “You spent half of the day trying to find it,” Kenneth recalls. “Or put it back together!” Pat laughs. Kenneth was one of the first on the scene of the crash that May morning long ago. Kindel was still in his seat, not moving; Kenneth thinks he had a heart attack and died before the plane crashed. Reverend Plapp was on the ground, a few feet away from the plane. Although Kenneth initially thought he’d been killed too and approached to cover him, the otherwise tragic day did surrender one bit of good news. Despite numerous injuries, the reverend had survived. After lunch, Kenneth takes the ATV out to visit three old marble tombstones in a pioneer cemetery farther up Dark Canyon. Landscaped with locoweed and grasses, the graves are those of Captain John Summerfield Shattuck, whose title was earned in the cavalry during the Civil War, his wife, Julia, and Julia’s sister, Mariah. The Shattucks arrived here at the end of the 19th century. The ensuing two decades were good years in Queen. Dances and picnics brought people together, and the population reached some 60 people, enough to warrant a heyday. After the Shattucks’ eldest child, Julia, married, she and her husband, Walter Thayer, helped establish what became the X Bar Ranch—the site of the morning’s apple picking. Captain Shattuck died in 1900, his wife in 1920. “We will meet again,” the captain’s gravestone promises. There are other graves in these mountains, and other reminders of the past in the present. Some are very close by. In the front yard of the McCollaum place are the remains of an old sawmill. It’s the very one Kenneth’s father used to plane the ponderosa timbers that still support the roof over at Rusty Smith’s church. The future is here in Queen as well. Several years ago, Queen residents set aside some 300 acres of land for a subdivision, opening lots for new residents. People like Elaine and Wayne Byers. In the front yard of their house on Turkey Canyon Road, Wayne is loading hay from his trailer to his barn. It’s for Elaine’s horses, former rodeo horses, which she’ll ride sometimes with Janet Cox through the forest. Wayne is retired from the police department in Los Alamos. Elaine works as a dental hygienist in Carlsbad. Of all the places they considered, Queen alone met the exacting criteria they set out for their new home. First of all, that home had to be around 6,500 feet elevation, because at that altitude, you get all four seasons, one following another, dependably. Second, it had to be rural, bordering public land. But third (and very important), still within 50 miles of a Wal-Mart, so that civilization remained within driving distance. Taking a break from loading hay, Wayne recalls seeing their house in Queen for the first time. Correct elevation, public land out the back fence, forty-eight miles to Wal-Mart. But the most promising sign was an actual sign—left by the previous owner, crafted in metal and welded atop the outside gates: LUCK OF THE DRAW. The Byers left the sign in place, because they do feel lucky to be here. The subdivision is also home to Queen’s newest arrivals, Barbara Derrick and Andrew Askwith. So new, in fact, that they only met some of her neighbors a couple months ago when the rains came down Dark Canyon and prevented anyone from crossing Last Chance Draw on the way up from town. They and others trying to get home to Queen, like Rusty Smith, met while waiting for the waters to subside. Barbara and Andrew divide their year between Queen—since Barbara has family in nearby Artesia—and the UK, where Andrew has family in Wales. There they operate a small sheep farm on a grassy eight-acre spread dotted with bluebells. Barbara and Andrew run their business from Queen. They support software programs that Andrew wrote that help designers model and build fabric structures—using experience from his past work designing paragliders. It’s a niche market, but that niche extends worldwide. As late afternoon becomes early evening, Barbara and Andrew sit down to dinner, but their meal is interrupted by a work e-mail—from Australia. It might be getting late here, but it’s the middle of the morning across the world, and the world doesn’t care that lasagna is in the oven in Queen. Across the highway, on the road to the church camp, lies a patch of land surrounded by a white metal fence. Nothing visually separates the land on either side of that fence—piñon and juniper trees share the grassy space with buttercups and cholla cacti, inside as well as out. Lizards and beetles, ants, and hidden things that move secretly through the grass continue their lives here unacknowledged, with no one to write their story. Sweet smells of earth and grass and piñon scent the evening air. “It’s a mountain community and a mountain cemetery,” Rusty Smith will say if you ask him to describe this hallowed ground. Many of the stones bear names of pioneer families: Magby, Reed, Middleton, McCollaum. Near the front gate lie two of the oldest graves, those of Elias Gipson Queen and his wife, Martha, our hosts for the day. The cemetery is a reminder that just as the seasons cycle through the Guadalupes, the human seasons cycle through Queen as well. As they do, connections form over genera- tions and across eras like latticework, giving those seasons meaning and purpose. Sometimes the purpose is just to laugh with friends in an apple orchard, or around the hearth of a stone chimney. Sometimes it’s to contemplate the world more deeply during a sermon offered under timbers hewn a lifetime before. Sometimes, perhaps, it’s to consider your own significance in the wake of a life abruptly ended. Night in Queen begins right here, in the cemetery itself. It’s stunning to watch it unfold. A chorus of crickets arises at one end of the grounds, met in counterpart by a second on the opposite, and together they sing the sun to sleep. Skies the color of pink roses give way to a horizon of baby blue and slate, and campfires flicker around the mountain as dusk calls all those unseen hunters back from the woods for another day. Overhead, that night sky that Wayne Byers was talking about emerges, full of stars and wonder. The Milky Way sends a gift of light from a million stars a million years away down onto the mountains and the community of Queen, onto a solitary chimney as tenacious as the earth on which it has stood for more than a century, onto a propeller aimed ever skyward, and onto all the good people for whom this special place is home.